When the human beings began manufacturing, the dream has always been to liberate mankind from tedious and laborious work. Machines doing things for man is the dream. Though 100% automation is still far away from us, our pursuit to highly automated manufacturing has yielded real progress. NEPCON South China to take place 30 August – 1 September will show off many new products, technologies and solutions covering IoT, smart wearables, bio-communications, and other trendy electronics hotspots. EMA as a key highlight of the industry will continue to be the focus of visitors as it represents one of the biggest industry expectations. With the rising labor and raw materials costs in China over the past couple of years, electronics manufacturers have been struggling to survive. The demand for cost efficiency is forcing the EMA trend on the whole industry, which is working hard to reduce human labor costs and enhance competitiveness. With the launch of Made in China 2025, some Chinese electronics manufacturing leaders have started the EMA transformation process, which in turn has created waves of EMA progress across the industry. It is against such backdrop that NEPCON South China 2016 takes place as smart manufacturing and EMA are sure to be under the limelight. To offer a comprehensive picture of the best EMA technologies home and abroad, the organizer launches a big EMA zone in Halls 1 and 2 at Shenzhen Conference and Exhibition Center. The zone offers the latest technologies and solutions in the areas of industrial robotics, motion control, machine vision, sensors, powertrain, automation equipment/parts, aero-mechanics parts, system integration, EMA control software, and industrial safety. The visitors get to experience first-hand the cutting-edge of the industry as well as the latest EMA technologies and products across the world. As a leading event that offers professional EMA solutions, NEPCON South China not only offers a top trade and exchange platform for electronics manufacturing colleagues to collect information about cutting-edge technologies, but it also provides a choice venue for leading EMA players to promote their products, particularly by launching new products. As of now the EMA zone has seen active registration with exhibitors. Confirmed exhibitors include KUKA, UNIVERSAL ROBOTS, HIWIN, and Smart-Win in the industrial robotics sector; SMD, SIM Technology, Robo-technik, and B-padynamics in the system integration sector; BECKHOFF, B&R, Leadshine, Moons, and Hiwin in the motion control sector; SCHNEEBERGER, HIWIN, TOYO, ETEL, W-Robot, and Dahua in the powertrain sector; Festo, Airtac, and CHELIC in the aero-mechanics sector; and KEYENCE, Banner, OptiRom, and Jindongkang in the sensors sector. The presence of leading exhibitors helps provide a strong engine for industry upgrade and transformation. Visitors and buyers get to discover off-the-shelf EMA solutions at the zone, which provides great facilitation for commerce and exchange. Among the leading exhibitors, Festo of Germany is a global automation player that leads in basic and advanced technical training. Festo has long been committed to the Chinese market by offering plant automation as well as aero-mechanic and electric technologies. At NEPCON South China 2016, Festo brings about its triangular motion device without control cabinet, a solution that embodies Industry 4.0 concept. The system includes CPX-based EXPT and a whole new integrated EMCA, capable of over 100 samples per minute. It moves freely in a 3D environment. As a truly revolutionary system that leads the technological trend, it leverages CPX to support robotics control, representing a frog leap by Festo in the area of distributed automation. With IP65/67 safety, the controller and triangular motion device for the first time have no need for a control cabinet. Universal Robots, based in Denmark and a global leader of human-robotics coordinated work, comes to NEPCON South China 2016 with its newly introduced soft memory chip assembly solution designed for notebooks, desktops, and servers. The solution supports electronics manufacturers of all sizes to accelerate the smart manufacturing process. The robot-arm works like the human operator’s arm, while the force sensors and clips are equal to the human fingers. The open Linux OS and the force control module ensures soft assembly of complex parts such as CPU and DIMM memories thanks to precision positioning with contact adjustment. With the easy setup of the hardware and the intuitive software, Universal Robots’ force sensor + robot co-worker solution represents a key breakthrough in the industry. Schmalz of Germany boasts a long history of nearly 100 years and a talented international design team with over 30 years’ engineering experiences as well as about 450 patents. The Schmalz solutions in the four areas of vacuum parts, vacuum sucking devices, vacuum easy moving system, and vacuum clipping system are widely used in carpentry, automotive, electronics, logistics, and packaging. Schmalz is the true leader of the vacuum technologies in the world. At NEPCON South China 2016, Schmalz comes with special suction cups, including contactless, magnetic, needle, photovoltaic, and composite cups. The new vacuum solutions and services help bring about bigger value to customers while significantly enhancing productivity and efficiency. 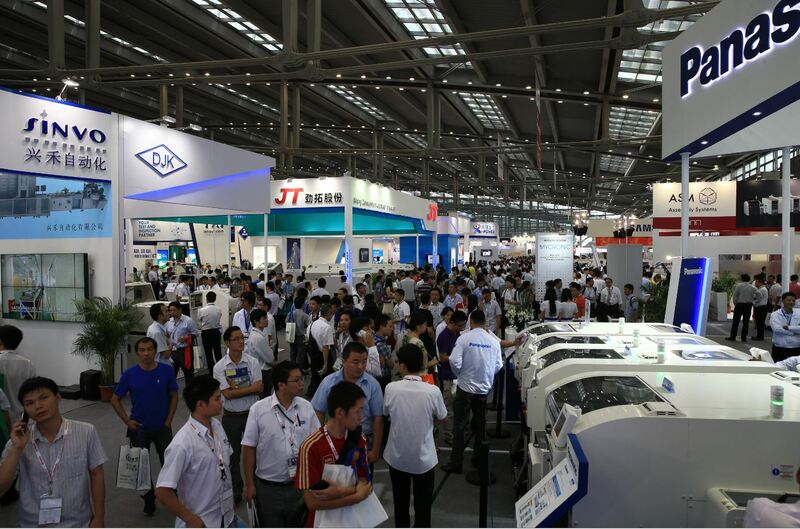 It is worth noting that NEPCON South China 2016 not only gathers leading electronics manufacturing exhibitors, but it also leverages the business model of show + forum whereby exhibitors and visitors benefit from multiple forums and industry summits that help enhance exchange and cooperation. NEPCON and Smart Plant 1.0 – Future of Electronics Manufacturing Summit Forum, a key highlight in past NEPCON instalments, will continue to play a big role in the 2016 event. Despite the rapid growth of the Chinese electronics manufacturing industry, the overall competitiveness and the capacity for sustainable development of Chinese players are not strong enough. Chinese players suffer from low value added, lack of innovative capability, and weakness in automation and IT systems. The Smart Plant framework integrating digital smart technologies with IT flows throughout the production lifecycle is a key tool for Chinese manufacturers to improve overall competitiveness. So, how does an electronics manufacturer complete the transformation process? What does the path from traditional manufacturing to smart automation look like? Reed Exhibitions will work together with CSAA to launch NEPCON and Smart Plant 1.0 – Future of Electronics Manufacturing seminar. Invited leading experts will explore advanced automation products, technologies and standards in the electronics manufacturing sector and share with the audience about smart manufacturing solutions and case studies. The organizer will offer about a dozen activities during the three-day event, including forums, procurement functions, seminars, and exchanges as experts, exhibitors, and visitors exchange to discover industry value added. The activities are sure to encourage even more enthusiasm amongst all stakeholders at the event. A big happy surprise is coming as, for the first time, NEPCON South China 2016 is taking place together with two other shows side by side – CS Show and ICMD. The four halls offer four industry hotspots PCB, EMA, EMS, and ICMD as exhibitors and visitors alike enjoy widened exchange and better interactive space. All the highlights are awaiting you at Shenzhen Confernce and Exhibition Center on 30 August as the shows open to the audiences. Reed Exhibitions Greater China is a part of the world’s leading event organizer with 500 events in 43 countries: Reed Exhibitions. Reed Exhibitions has 3,700 employees worldwide, and runs a portfolio of exhibitions and conferences that serve 43 industry sectors across the Americas, Europe, the Middle East, Asia Pacific and Africa. In 2014, Reed Exhibitions brought together over seven million event participants from around the world, generating billions of dollars in business for its customers. Reed Exhibitions is a division of RELX Group, a professional information and work process solutions provider, covering science, medical, law, risk management, and B2B commercial areas. After over three decades of rapid growth, Reed Exhibitions Greater China now owns nine outstanding member companies: Reed Exhibitions China, Reed Sinopharm Exhibitions, Reed Huabo Exhibitions, Reed Huaqun Exhibitions, Reed Exhibitions (Shanghai), Reed Guanghe Exhibitions, Reed Huabai Exhibitions, Reed Hongda Exhibitions and Reed Kuozhan. Currently, over 500 staff help Reed Exhibitions Greater China to serve 12 specialized sectors: Electronics Manufacturing & Assembly; Machine Tools, Metalworking & Industrial Materials; Converting; Life Sciences & Pharmaceuticals, Health Care, Beauty & Cosmetics, Sports & Recreation; Gifts & Homeware; Auto Aftermarket; Lifestyle; Gaming; Publishing; Property & Travel; Marine, Energy, Oil & Gas; Broadcasting, TV, Music & Entertainment. As of December 2015, Reed Exhibitions Greater China held over 50 events and brought together over 1.07 million visitors and nearly 50,000 conference delegates. Our events hosted more than 32,000 suppliers whose stands occupied more than 1.6 million sqm of show floor space.